One of the most controversial issues in the climate change debate. The basic concept is simple: governments, companies or forest owners in the South should be rewarded for keeping their forests instead of cutting them down. The devil, as always, is in the details. Deforestation and forest degradation, through agricultural expansion, conversion to pastureland, infrastructure development, destructive logging, fires etc., account for nearly 20% of global greenhouse gas emissions, more than the entire global transportation sector and second only to the energy sector. IPCC estimates that land-use change conversion of forest into agricultural land) contributes a net 1.6 ± 0.8 Gt carbon per year to the atmosphere. For comparison, emissions from fossil fuel combustion and cement production amount to 6.3 ± 0.6 Gt carbon per year. In order to constrain the impacts of climate change within limits that society will reasonably be able to tolerate, the global average temperatures must be stabilized within two degrees Celsius. This will be practically impossible to achieve without reducing emissions from the forest sector, in addition to other mitigation actions. The 2010 Cancun Conference (COP-16) recognized the much broader contribution of forest-related activities in efforts to limit climate change. Specific recognition was given to the reduction of deforestation and degradation through such initiatives as REDD and REDD+. This means that forests will be included in any future agreement with the possibility of generating international credits from these activities. Reducing Emissions from Deforestation and Forest Degradation (REDD) is an effort to create a financial value for the carbon stored in forests, offering incentives for developing countries to reduce emissions from forested lands and invest in low-carbon paths to sustainable development. “REDD+” goes beyond deforestation and forest degradation, and includes the role of conservation, sustainable management of forests and enhancement of forest carbon stocks. Governments in developing countries with tropical forests hope to be able to reduce their deforestation rates without being financially disadvantaged, through a system of positive financial incentives. There are now a number of other proposals on the table as well, and some of these suggest financial mechanisms other than carbon credits with which to fund a REDD mechanism. All are also based on the idea that Northern countries are responsible for providing financial support to Southern countries’ climate change mitigation and adaptation activities; and seek to generate a significant level of compensation or economic incentive to outweigh the income generated through deforestation. Afforestation - The process of creating forests on land that was previously unforested, typically for longer than a generation. In some places, forests need help to reestablish themselves because of environmental factors. For example, in arid zones, once forest cover is destroyed, the land may dry and become inhospitable to new tree growth. Other factors include overgrazing by livestock, especially animals such as goats,cows, and over-harvesting of forest resources. Together these may lead to desertification and the loss of topsoil; without soil, forests cannot grow until the long process of soil creation has been completed - if erosion allows this. In some tropical areas, forest cover removal may result in a duricrust or duripan that effectively seal off the soil to water penetration and root growth. Mechanical breaking up of duripans or duricrusts is necessary, careful and continued watering may be essential, and special protection, such as fencing, may be needed. A/R Project - CDM Afforestation and Reforestation Project. Deforestation, particularly in Brazil, Indonesia and parts of Africa, account for about 20% of greenhouse gas emissions. Deforestation can be avoided either by paying directly for forest preservation, or by using offset funds to provide substitutes for forest-based products. CDM project activities can be categorized into “Emission reduction project” and “Sink project”. Sink projects are to absorb carbon through afforestation or reforestation activities. CCB Standards - Can be applied throughout the life of the project to evaluate the social and environmental impacts of land based carbon projects. The CCB Standards can be combined with many other standards, such as the Clean Development Mechanism (CDM), or the Voluntary Carbon Standard (VCS). The CCB Standards provide a basis for evaluating a project’s social and environmental impact, while the carbon accounting standard enables verification and registration of quantified greenhouse gas emissions reductions or removals. Using both standards together enables investors to select carbon credits with additional benefits, while screening out projects with unacceptable social and environmental impacts. The standards comprise fourteen required criteria and three optional "Gold Level” criteria. Once a project has been designed, a third-party evaluator will use indicators to determine if individual criteria are satisfied. As of December 2010, a total of 28 projects have completed validation, and 23 other projects have initiated the validation process. Of these 51 projects, 41 are in developing countries and represent exciting initiatives to stimulate investment, jobs, biodiversity conservation and many other social and environmental benefits. At least 100 projects are planning to use the standards, representing over 7 million ha of conservation and over 370,000 ha of restoration of native forests with total estimated annual emissions reductions of over 12.7 million tons annually. CDM - Clean Development Mechanism - Allows emission-reduction projects in developing countries to earn certified emission reduction (CER) credits, each equivalent to one tonne of CO2. These CERs can be traded and sold, and used by industrialized countries to a meet a part of their emission reduction targets under the Kyoto Protocol. The mechanism stimulates sustainable development and emission reductions, while giving industrialized countries some flexibility in how they meet their emission reduction limitation targets. CER - Certified Emission Reductions - A type of emissions unit (or carbon credits) issued by the Clean Development Mechanism (CDM) Executive Board for emission reductions achieved by CDM projects. HWP - Harvested Wood Products - According to the IPCC good practice guidance (2003) include wood and paper products. It does not include carbon in harvested trees that are left at harvest sites. Emissions and removals associated with forest harvesting and the oxidation of wood products are accounted for by the country in the year of harvesting (removal). The proposed method recommends that storage of carbon in forest products be included in a national inventory only in the case where a country can document that existing stocks of long term forest products are in fact increasing. RIL - Reduced Impact Logging - An established set of timber harvesting practices designed to reduce the damage to the forest from timber extraction. Construction of water bars (small ditches) across roads and skid trails to divert runoff and reduce erosion. Corridors – forest areas that connect two or more larger blocks of forest. Silviculture: IFM also includes practices to ensure regeneration of native timber tree species, which helps maintain native tree diversity and provide a long-term source of income and employment. Some of these practices reduce emissions (e.g. extended rotation times, reduced damage to crop trees) while others can increase emissions (e.g. larger canopy openings to regenerate shade intoleran timber species); thus, careful planning is often necessary to achieve both emissions reductions and sustainable timber supply. LULUCF - Land Use, Land Use Change and Forestry - Defined by the UN Climate Change Secretariat as "A greenhouse gas inventory sector that covers emissions and removals of greenhouse gases resulting from direct human-induced land use, land-use change and forestry activities." LULUCF has impacts on the global carbon cycle and as such these activities can add or remove carbon dioxide (or, more generally, carbon) from the atmosphere, contributing to climate change. . Additionally, land use is of critical importance for biodiversity. MRV - Measurement, Reporting and Verification - Monitoring systems that allow for credible measurement, reporting and verification of REDD+ activities are among the most critical elements for the successful implementation of any REDD+ mechanism. Both remote sensing and ground based data is needed to monitor forest carbon emissions. UN-REDD is collaborating with the Group on Earth Observation (GEO), INPE and Google in order to improve access to data and expertise on remote sensing. NFI - National Forest Inventory - Provide a single authoritative source of forestry data at the national level. Ensure the development of sound forest policies. Ensure the viability of forest industries and the development of effective forest conservation strategies. PES - Payments for Environmental Services - National PES schemes are intended to compensate those providing environmental services (forest owners, for example). Costa Rica’s well-known scheme is intended to compensate farmers for not deforesting their lands. It is not a purely commercial mechanism: to meet its objectives it has relied upon additional subsidies (from a gas tax) and regulation, including a moratorium on deforestation. PES schemes are designed with conservation in mind, not poverty alleviation. REDD - Reducing Emissions from Deforestation and Forest Degradation - A set of steps designed to use market/financial incentives in order to reduce the emissions of greenhouse gases from deforestation and forest degradation. Its original objective is to reduce green house gases but it can deliver "co-benefits" such as biodiversity conservation and poverty alleviation. Deforestation is the permanent removal of forests and withdrawal of land from forest use. Forest degradation refers to negative changes in the forest area that limit its production capacity. 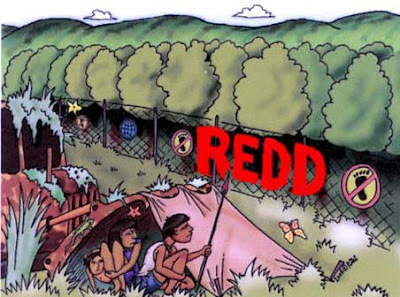 REDD is presented as an "offset" scheme of the carbon markets and thus, will produce carbon credits. Recent work shows that the combined contribution of deforestation, forest degradation and peatland emissions accounts for about 15% of greenhouse gas emissions, down from earlier estimates of 25% and about the same as the transportation sector. It is increasingly accepted that mitigation of global warming will not be achieved without the inclusion of forests in an international regime. As a result, it is expected to play a crucial role in a future successor agreement to the Kyoto Protocol. enhancement of forest carbon stocks. Reforestation - This process increases the capacity of the land to sequester carbon by replanting forest biomass in areas where forests have been previously harvested. Once set they cannot be changed during an implementation period. A fixed reference is fundamental for incentivizing action. They are based only on historical data of land uses, GHGs emissions/ removals, socio-economic variables no projections and no forward looking baseline in to minimize uncertainty past decade of economic growth may overestimate upcoming decade. Complete: gross GHGs emissions related to decreases in forest carbon stocks Gross carbon stock changes (∆C) in areas deforested (ADEF) during the reference period plus net decrease of carbon stocks (∆C) at national level in degraded forest land (ADEG) and non-CO2 gases emissions during the same period (Deforestation and degradation) – Category 3 / IPCC GPGS. If forest lost is matched by expanding plantations, this strategy could allow a country to benefit from increased revenue from both plantations and REDD credits. RMU - Removal unit On the basis of land use, land-use change and forestry (LULUCF) activities such as reforestation. Equal to one tonne of CO2 can be traded and sold under the Kyoto Protocol’s emissions trading scheme. SMF - Sustainable Forest Management - SFM can cover a wide range of very different forest management strategies from conversion of native forest to plantation to maintenance of old growth native forest in order to maintain it in a pristine condition. SFM is a term commonly used by the forest industry to cover these two extremes and everything in between. Sustainable Land Management - With nearly two times as much carbon in soil than in the atmosphere, small changes in the level of carbon in soils can drive large changes in atmospheric carbon concentrations. Sustainable land management projects that increase the carbon content of soils represent a “triple win” for society: development, climate change resilience, and climate change mitigation. A significant development was achieved at the Cancun Conference (COP 16). For the first time, the importance of stemming the loss of tropical forests for mitigating global climate change with financial support from the industrialized world was enshrined in an international agreement. The Kyoto Protocol’s Clean Development Mechanism has only allowed incentive payments to be made for afforestation and reforestation in developing countries, and only at the level of projects. With COP 16 decision, entire jurisdictions (including countries themselves) could receive incentives, subject to verification that emissions have been reduced against a reference level. All developing country activities referred to as “REDD+” are now eligible for financial support. The meteoric rise of REDD’s market share (+500% from 2009 to 2010) can be attributed to formal international recognition for REDD and conservation-based REDD+ as critical for climate change mitigation as well as likely pre-compliance interest in the project type under California’s emerging cap-and-trade program. At the same time, REDD gained market standing on the platform of the first REDD project methodologies approved for use by the Verified Carbon Standard (VCS) and through forest-focused third-party standards like Brasil Mata Viva (BMV). REDD+ calls for the involvement of the private sector, the role of markets in mobilizing funding for REDD+ still needs to be discussed under the UNFCCC. As stated in the background, in order to constrain the impacts of climate change within limits that society will reasonably be able to tolerate, the global average temperatures must be stabilized within two degrees Celsius. This will be practically impossible to achieve without reducing emissions from the forest sector, in addition to other mitigation actions. Cost Effective Carbon Abatement - The creation of low-cost offsets through a scheme, such as REDD+, offers import countries considerable opportunities for cost-effective abatement. The cost containment opportunities justify the considerable work needed to develop offset schemes. Structural Issues - How the system will work? What will be the unintended consequences? Baseline - Will it be based on current emissions levels or historical deforestation rates, a business-as-usual scenario? Will countries with different forest covers and historic deforestation rates hold different interests in the way the reference levels are constructed? A further critical element of the baselines debate concerns whether to measure standing carbon stocks instead. This approach is favored by countries that are still heavily forested and may have made considerable efforts to remain so. If they are excluded from REDD, the benefits would go only to the most prolific deforesters. Natural changes, such as forest fire and dieback, cannot be excluded (although it could be argued that these are no longer entirely natural, because of the impacts of climate change on weather patterns and forest health. Countries being rewarded for reductions relative to historic emissions and on the basis of reductions below an agreed global baseline; and supported by a combination of marketand fund-based financing (Strassburg, 2008). The use of a Target Band or Range Approach instead of a baseline, which allows countries to increase the financial benefits they accrue per credit the closer they get to their upper targets. However, this approach could make it difficult to generate full-value credits and to identify leakage. Measuring Forest Degradation - There is no consensus on the definition for forest degradation. If degradation is not included in REDD, great quantities of carbon could be lost without the system recognizing it. In some countries, such as those in the Congo Basin, losses from degradation tend to be much higher than those from deforestation. However, the fact that degradation data may be less reliable – and is more expensive to acquire – is likely to discourage carbon finance investors, which may mean negotiators choose to exclude degradation in order to accommodate carbon trading. These gases are influenced by land use, land-use change, and forestry activities (e.g., restoration of wetlands, biomass burning, and fertilization of forests). Hence, to assess the greenhouse gas implications of LULUCF activities, changes in CH4 and N2O emissions and removals — the magnitude of which is highly uncertain — would have to be considered explicitly. There are currently no reliable global estimates of these emissions and removals for LULUCF activities. Ex-Post Payments and Liability Contracts - Carbon finance is also likely to disadvantage smaller players. Payments may be made ‘ex-post’, which means that the project is paid after the delivery of emissions reductions, because of the uncertainty associated with REDD. This would be difficult for smaller projects because they would have to fund upfront and operational costs from other sources. Alternatively, projects may have stringent risk assessments and contractual liability arrangements attached to them, meaning that the seller bears the risk of project failure. Both scenarios would be particularly onerous for smaller projects run by local communities. Carbon Leakage - Negotiators are also concerned that REDD projects may halt deforestation at one site, but that illegal logging practices could be shifted elsewhere. Will the programme actually slow deforestation or will loggers just move to areas not covered by the scheme? A project-level approach could mean that deforestation activities simply shift to another area in the same country (depending on the specific causes of deforestation in that country). One approach to this predicament is to focus efforts at the national level and to involve as many countries as possible. Even so, a question still remains about possible leakage from tropical forests to boreal and temperate forests. Norway is working on a project with Guyana to avoid leakages that would lead to deforestation pressures moving to countries with currently low deforestation, like Guyana, when current high deforesters start to reduce their rates. Ultimately, the only real solution is to remove the underlying causes of deforestation. Commercial agriculture, including large-scale cattle ranching, is the predominant driver of deforestation in Latin America and Northern Dry Africa; and commercial crops, including for biofuels feedstocks, predominate in some South-East-Asian countries. On the other hand, commercial timber extraction is a more influential driver in South-East Asia as a whole. Commerical fuelwood extraction has also been identified as an emerging driver in ‘forest-poor’ countries with rapidly expanding urban centers , although it is important to bear in mind that much fuel wood collection is probably of fallen dead wood or offcuts from industrial felling. Forward Selling - Trees reach maturity over a course of many decades. Project developers and offset retailers typically pay for the project and sell the promised reductions up-front. Permanence - Forests, or at least trees, are impermanent by nature, and forest fires, disease, climatic changes, natural decay and timber harvesting could impede reductions in deforestation rates. Human causes clearing, burning, or mismanagement From an investor’s point of view this is a significant challenge to guaranteed profit-generation and the reason why ex-post payments are likely to be preferred. In other systems, this is resolved by the use of short-term and long-term temporary credits (tCERs and lCERs respectively), which have to be renewed at the end of a given period or if forest stocks disappear for any reason. Thus the liability for the project rests with the purchaser (although purchasers can also insure against credits expiring unexpectedly). However, temporary credits generate less income, so the sellers may prefer to shoulder liability themselves and sell more expensive permanent credits. Transaction Costs - REDD carbon credits might be so complex and have such high transaction costs that only gthe largest companies operating to economies of scale are able to participate. because of the uncertainties associated with deforestation projects (because of storms or forest fires, for example) project managers are likely to find themselves saddled with the projects’ risks and liabilities. They may also find themselves responsible for finding upfront funding and operational costs to tide them over until they are paid at the end of the project period. Either way, larger and richer organisations operating to economies of scale can deal with these difficulties much more easily, than Indigenous Peoples and local communities, who may therefore find themselves in a poor negotiating position right from the start. They may also have to address language barriers and hire or find assistance to deal with the technical complexities involved in establishing, monitoring and verifying REDD projects. Monopsony Structure - Largely due to the limited number of organisations capable of verifying carbon measurements to IPCC standards. Commodities markets are already unfavorable to producers and privilege intermediaries, largely because of the inherent nature of commodities themselves. Moreover, REDD’s global reach and scale suggest that intermediaries will obtain monopsony positions relative to projects.This results in the homogenisation of prices offered by the credit buyer to a project developer. More importantly, it also diverts the benefits of REDD+ away from communities and towards the middle men, in contrast to REDD+’s stated developmental objectives, whilst increasing the costs of REDD+. Poor Transaction Structure - Transactions in REDD are structured as over-the-counter (OTC) arrangements, a fact that impedes REDD’s developmental goals and leads to a serious misallocation of resources. Forest carbon is a commodity. It is sourced – and may even be traded – “over the counter” (OTC), meaning outside of an exchange trading process. It is then aggregated and traded by intermediaries. The first transaction, where a project sells its carbon to an intermediary, is referred to as the “primary” market. Secondary markets are where the intermediary places that carbon with other parties – end users of credits, governments, speculators, private investors and the like. The primary-secondary structure is not a choice. It is inherent to REDD’s design because the people generating the asset are neither qualified nor inclined to trade their assets on a market. Default. OTC contracts are bilateral, so that the counterparties are subject to market risk as well as default risk from their counterparty. This is more dangerous in REDD, where forest projects in OTC deals are completely dependent upon a single, controlling counterparty and may be completely ruined by a default. Also, because projects have very little interaction with each other, multilateral default protections do not exist. Pricing Power - Active participants may have significantly better knowledge of market conditions and contract terms than occasional participants. This most especially disadvantages forest communities and REDD project managers, for whom an OTC carbon “trade” is a once-in-a-lifetime decision. The result will be that REDD projects will receive lower prices for their carbon, forcing them to cut operational costs. Complexity - Derivatives contracts are complex legal documents and firms with more experience are also more skillful in structuring them to their advantage. This is compounded by the difficulty of creating support systems for these businesses – due to the complexity of the requirements, the pricing and risk management systems that support these markets frequently do not completely match the actual contract terms. Again, this will represent a major disadvantage for REDD projects, who will be forced to either muddle through these issues or engage expensive outside help. Oversight - This asymmetry of information applies to regulators in these markets as well. They cannot observe systemic risks building until those risks have already had a negative impact, and regulatory actions must be prescriptive rather than preventive. Poorly Defined Assets - From a trading point of view, the process which forest creates carbon is ill defined to the point of being unacceptably risky. It contains a vague, poorly defined and scientifically unreliable process for creating forest carbon. Reduced Emission Reductions - To what extent can large emitting nations be allowed to use credits as a substitute for internal efforts to reduce emissions? Will REDD credits flood carbon markets and drive down prices making them a more attractive option than emission cuts? Leading conservation groups opposed the inclusion of forestry credits in the Kyoto Protocol due to fear that cheap carbon credits would flood the carbon market, thereby stalling other climate change mitigation programs. Allowing countries with carbon intensive lifestyles to continue consuming inequitably and unsustainably, by permitting them to fund cheaper forest carbon 'offsets' in developing countries, diverts critical resources and attention away from measures to address fossil fuel consumption and the real underlying causes of deforestation. Price of Timber - REDD could significantly reduce the supply of timber which could lead to rapidly increasing timber prices and thus more incentive to deforest. Reducing demand for timber and agricultural commodities must be an immediate priority. Yet REDD as it is currently construed seems most unlikely to address this issue. Worse, it could even aggravate the situation by reducing timber supplies. Illegal Logging is often listed as one of the prime proximate drivers of forest degradation, and one of the hardest to stop, especially in the absence of any reduction in demand for timber. Yet without such a reduction in demand, REDD could actually increase illegal/industrial logging (by leading to an increase in timber prices, as discussed above). It may not be reasonable to assume complex REDD policies involving large amounts of money work in countries unable to contain illegal logging and forest conversion in the first place. And if increased infrastructure, good governance and financing can help to stem these illegal activities, why not use new or existing policy measures to target these aspects directly? Price of Land - If REDD leads to timber or land increasing significantly in price, as may already be happening, it is likely to have significant impacts on poor forest-dwelling communities and on land reformprogrammes.The simple fact of the forest becoming an increasingly valuable commodity will mean that it is more likely to be wrested away from local people. Political Risks - Who benefits? Distribution of Benefits - How can the benefits from REDD be distributed to forest communities in a just, equitable way that minimizes capture of the benefits by national governments or local elites? Local inhabitants, the communities that live in the forests, might be bypassed, not consulted and won't actually receive any revenues. Loss of Sovereignty - Prioritising investment decisions that focus on maximizing profits and allowing foreign investors to buy up forest services reduces developing countries’ sovereignty over their natural resources. This is one of the reasons given by Brazil’s opposition for opposing the use of carbon markets to fund REDD and is the reason why it has proposed an alternative funding mechanism. Indigenous Rights - To whom, if anyone, do forests belong is a key moral and ethical dilemma. And who has the rights to sell forest carbon credits? It is certainly clear that in the absence of secure land rights, Indigenous Peoples and other forest-dependent communities have no guarantees that they will receive any form of REDD incentive or reward for their extensive forest conservation efforts. REDD policies will trigger a rapid expansion in lands set aside for REDD projects. In many countries, governments and businesses are likely to ignore the customary and territorial rights of Indigenous Peoples, as they seek to protect an increasingly valuable resource, violently or otherwise. The simple fact that forests are becoming an increasingly valuable commodity means that they are more likely to be wrested away from local people. Commodifying forest carbon is also inherently inequitable, since it discriminates against people, and especially women, who previously had free access to the forest resources they needed to raise and care for their families, but cannot afford to buy forest products or alternatives. Any REDD projects that deny local communities and Indigenous Peoples access to forests risk having grave impacts on poverty and the achievement of the Millennium Development Goals. Traditional, sustainable types of forest farming, that are known to gradually increase carbon sequestration. Corruption - Facilitate corruption and poor governance in countries with tropical forests, because of the large sums of money proposed and the complex nature of the financial mechanisms likely to be involved. Given the current political institutions in many developing countries, it is likely that significant financial power will be given to a very small group of people or one individual. Forestry departments are among the most corrupt departments in some of the most corrupt countries in the world. REDD could offer the opportunity to corrupt government officials to benefit from low rents in some areas and REDD income in others. Monocultures and Invasive Species - In an effort to cut costs, some tree-planting projects introduce fast-growing invasive species that end up damaging native forests and reducing biodiversity. For example, in Ecuador, the Dutch FACE Foundation has an offset project in the Andean Páramo involving 220 square kilometres of eucalyptus and pine planted. The NGO Acción Ecológica criticized the project for destroying a valuable Páramo ecosystem by introducing exotic tree species, causing the release of much soil carbon into the atmosphere, and harming local communities who had entered into contracts with the FACE Foundation to plant the trees. However, some certification standards, such as the Climate Community and Biodiversity Standard require multiple species plantings. Plantations Included in REDD Definition - Plantations are not forests. Large-scale monoculture tree plantations cause serious environmental, social and economic problems. Furthermore, plantations store only 20% of the carbon that intact natural forests do. It thus seems inconceivable that the UN Framework Convention on Climate Change (UNFCCC) would sanction any process that allows natural forests to be replaced with plantations. Yet this is exactly what is being proposed in REDD. Some countries even support a ‘net deforestation’ approach: this would allow them to continue logging and cutting forest to make way for agricultural commodities, including biofuels, in some areas, while conserving forests and/or extending plantations in others. Albedo effect - A study suggested that "high latitude forests probably have a net warming effect on the Earth's climate", because their absorption of sunlight creates a warming effect that balances out their absorption of carbon dioxide. This view is however being challenged by other studies showing that despite the negative albedo effects of temperate forests there is a net benefit and in addition there is weak evidence of a positive albedo effect in the tropics from clouds generated by forests. Will Good be the Enemy of the Necessary - It is argued that the cumulative atmospheric concentration of CO2 can be reduced by deferring deforestation: even if deforestation rates return to their original level after a certain period, cumulative concentrations of greenhouse gases will still be less than they would have been (Ebeling, 2007). There now seems to be increasing governmental consensus around what is known as the ‘50-50-50’ option which involves: “reducing deforestation rates 50% by 2050 and then maintaining them at this level until 2100 which would avoid the direct release of up to 50GtC [gigatonnes of carbon] this century, equivalent to nearly 6 years of recent annual fossil fuel emissions. Equity - Because REDD is primarily intended to create financial incentives that will prompt those engaged in deforestation to switch to managing standing forests., it would reward those engaged in logging and industrial agriculture, while ignoring those countries and communities that have low deforestation rates. REDD - Ignores Root Causes of Deforestation - Nailing down demand-side drivers in importing countries and resolving governance, poverty and land tenure issues in forested countries. Market Bias - The use of methodologies that include exporters’ profits as opportunity costs also implies that those companies might be compensated for lost profits; and that only the market can change concession-holders or other land-holders’ behavior. However, as can be seen in Indonesia, it is quite possible for politicians to simply revoke concessions for logging and commodity production if they have sufficient incentive to do so. Considering the ‘full’ costs, including company profits, generates extremely high figures which are then used to justify the use of carbon trading, on the basis that no other funding source can generate finance on the scale required. Structure - Many of the emission reduction opportunities are beyond CDM, notably in the REDD+ space. They do not have clear methodologies and are in sectors that may not be amenable to conventional financing. Organizing, financing, and implementing carbon projects in such sectors as low-tillage agriculture and sustainable land management will require developing new organizational and financing models. Indigeneous Rights - The knowledge and rights of indigenous peoples and local communities must be respected. Indigenous peoples and local communities must be able to participate fully and effectively. into account national legislation and sovereignty. REDD+ must not encourage the conversion of natural forests to plantations. GRIF - Guyana REDD Investment Fund - Norway will be the first contributor to the GRIF, and will pay US$30 million into the fund when it is established, planned at the end of this month. The payment is in recognition of Guyana’s efforts to protect its 16 million hectare rainforest, and follows the memorandum of understanding signed by the two countries in November last year. Norway intends to pay up to US$250 million into the GRIF between 2010 and 2015, based on Guyana’s performance in avoiding greenhouse gas emissions from deforestation and forest degradation, as well as Guyana’s on-going and planned strengthening of inclusive and transparent forest management. Guyana will invest GRIF revenues to implement the country’s Low Carbon Development Strategy (LCDS). This will enable Guyana to place its forest under long-term protection, catalyze public and private investment for clean energy (to move virtually the entire economy away from fossil fuel energy dependence), and create new low carbon economic and employment opportunities for forest dependent communities and other Guyanese citizens. The process will be evolving with the full and effective participation of involved stakeholders, including indigenous peoples groups. In June 2011, The Norwegian Government responded to the eight points of contention documented by a body of civil society personalities on March 24, 2011, as to the state of affairs of the Guyana REDD Investment Fund, saying that the partnership is very much a work in progress, one that will improve over time. With respect to the complaint over the delays in the preparation of projects, the letter said that getting the modalities of the GRIF sufficiently established and getting the projects approved by the GRIF Steering Committee has taken longer than expected. “This is a reflection of getting a new system to work, including with respect to the application of fiduciary, environmental and social safeguards,” the letter said. It noted that it is taking the matter seriously and said the Government of Guyana has prepared six projects and the respective partner entities are at present reviewing these. It said that as of now, no funds have been disbursed from the GRIF, even though Norway has already released the funds to Guyana, amounting to US$70M. Another issue that the stakeholders raised in their letter is that of the rate of deforestation under the agreement. The Norwegian letter explained that the intention of the agreement is to maintain a low level of deforestation. “By any means of comparison, the deforestation rate in Guyana remains extremely low. At deforestation rates as low as those observed in Guyana, even very small deforestation events will cause significant [percentage-wise] changes in the deforestation rate,” the letter stated. It said Guyana and Norway are intent on quickly disincentivizing any systematic upward trend in Guyana’s deforestation rates. “Based on the revised numbers, we have therefore put in place an incentive structure for that purpose. The incentive structure is publically available in our Joint Concept Note and implies payments start to fall at 0.56 percent deforestation and cease completely at 0.1 percent. By any measure, this is ambitious,” the letter said. It said that to further strengthen transparency and credibility of forest management practices and authorities in Guyana, Norway has agreed to establish Independent Forest Monitoring in the country. “An open, competitive tender process to procure the services of a credible party to fill this role has just been completed. When the IFM becomes operational in the near future, this will also be an important recipient of any information you may possess regarding suspected irregularities in the Guyanese forestry sector,” the letter stated. Regarding the need for strong and consistent safeguards, the letter said that these safeguards will be applied with those of the IDB, the World Bank and the UNDP, dependent on which institution will be partner entity for the relevant project. It noted that these institutions have played an important role as channels for the Norwegian multilateral cooperation for many years. They have environmental, social and fiduciary safeguards that are compatible with the requirements for the use of Norwegian funds,” the letter said. With regard to the complaint about the weak participatory process, the Norwegian letter advised that the stakeholders make their concern known to the authorities in Guyana. Norway Indonesia REDD+ Partnership - Indonesia’s deforestation rates are significant, and recent estimates indicate that between 2000 and 2005, 3.5 million hectares of forests have been lost (an area larger than Belgium), or around 2.9% of Indonesia’s total forest area. In October 2009, President Susilo Bambang Yudhoyono committed to reducing Indonesia’s CO2 emissions by 26% against a business-as-usual trajectory in 2020, the largest absolute reduction commitment made by any developing country. Indonesia has set a bold target and Norway wanted to support the Indonesian government’s efforts to realize its commitment. In May 2010 Norway and Indonesia signed a letter of intent to support Indonesia’s efforts to reduce greenhouse gas emissions from deforestation and degradation of forests and peat lands. Norway will support these efforts with up to 1 billion US dollars based on Indonesia’s performance, over the course of the next 7- 8 years. The partnership has three phases. In the first phase, funds will be devoted to finalizing Indonesia’s climate and forest strategy and putting in place enabling policies and institutional reforms. ii. Establishing a degraded lands database, starting in one or more appropriate provinces, to facilitate the establishment of economic activity on such lands rather than converted peatland or natural forests. iii. Enforcing existing laws against illegal logging and trade in timber and related forest crimes and set up a special unit to tackle the problem. iv. Taking appropriate measures to address land tenure conflicts and compensation claims. In the third phase, starting in 2014, the contributions-for-verified emissions reductions mechanism will be implemented nationally. In 2010 the money was spent on completing a national REDD+ strategy for Indonesia. However, the money will be distributed over a 7-8 year period and most of the funds are tied to verified emissions reductions by Indonesia. One focus-area of the partnership is sustainable management of forest and reduced emissions from the forest. Papua and Kalimantan are two areas of Indonesia with large tropical rainforests intact. They are also areas where insecure land tenure currently gives indigenous people and local communities little incentive to contribute to more sustainable management of forest. Indonesia agreed to declare a two-year suspension on new concessions on conversion of natural forests and peat forests into plantations. The suspension was signed Indonesia's President in May 2011. This is not a “ban”, it is a temporary suspension, which applies only to “new concessions”. The Letter of Intent has nothing to say, and will not affect, concessions for clearance that have already been awarded, but not yet cleared. According to Greenomics-Indonesia, a Jakarta-based NGO, community and village forestry licenses are not among the many exemptions spelled under the presidential instruction that defines the moratorium. The instruction, issued last month, grants exemptions for industrial developers and allows business-as-usual in secondary forest areas by the pulp and paper, mining and palm oil industries. "The only exceptions in the Presidential Instruction are for big business. In reality, the granting of licenses for community and village forestry development should have been prioritized for exclusion from the moratorium, especially as such activities are not environmentally destructive," said Greenomics Executive Director Effendi Effendi. Kenya Agricultural Carbon Project - The first project in Africa that sells carbon offsets from a sustainable land management project, improving the livelihoods of rural communities while tackling climate change. It brought the potential for carbon sequestration in soils to the forefront of carbon finance. Implemented by the Swedish NGO Vi Agroforestry, the project is located on over 40,000 hectares in the Nyanza Province and Western Province of Kenya. Smallholders and small-scale business entrepreneurs are trained in diverse cropland management techniques, including cover crops, crop rotation, compost management, and agroforestry. The farming practices both increase the yield of the land and sequester carbon in the soil. The project is developing the Sustainable Agriculture Land Management Methodology under the VCS. The first validation was finalized in November 2010 by Scientific Certification Systems. The project is currently undergoing the second validation. The BioCarbon Fund is leading the methodological work, together with Vi Agroforestry. It will purchase 150,000 emission reductions up to 2016. Green Wall of China - a series of human-planted forest strips in the People's Republic of China, designed to hold back the expansion of the Gobi Desert. It is planned to be completed around 2074, at which point it is planned to be 2,800 miles long. China has seen 3,600 km2 of grassland overtaken every year by the Gobi Desert. Each year dust storms blow off as much as 2,000 km2 of topsoil, and the storms are increasing in severity each year. These storms also have serious agricultural effects for other nearby countries, such as Japan, North Korea, and South Korea. The Green Wall project was begun in 1978 with the proposed end result of raising northern China’s forest cover from 5 to 15 percent and thereby reducing desertification. The 4th and most recent phase of the project, started in 2003, has two parts: the use of aerial seeding to cover wide swaths of land where the soil is less arid, and the offering of cash incentives to farmers to plant trees and shrubs in areas that are more arid. A $1.2 billion oversight system, including mapping and surveillance databases, is also to be implemented. The “wall” will have a belt with sand-tolerant vegetation arranged in checkerboard patterns in order to stabilize the sand dunes. A gravel platform will be next to the vegetation to hold down sand and encourage a soil crust to form. The trees should also serve as a wind break from dust-storms. As of 2009 China’s planted forest covered more than 500,000 square kilometers (increasing tree cover from 12% to 18%) – the largest artificial forest in the world. However, of the 53,000 hectares planted, a quarter has died and of the remaining many are dwarf trees, which lack the capacity to protect the soil. In 2008 winter storms destroyed 10% of the new forest stock, causing the World Bank to advise China to focus more on quality rather than quantity in its stock species. There is still debate on the effectiveness of the project. If the trees succeed in taking root they could soak up large amounts of groundwater, which would be extremely problematic for arid regions like northern China. For example, in Minqin, an area in north-western China, studies showed that groundwater levels dropped by 12-19 meters since the advent of the project. Land erosion and overfarming have halted planting in many areas of the project. China's booming pollution rate has also weakened the soil, causing it to be unusable in many areas. Furthermore, planting blocks of fast-growing trees reduces the biodiversity of forested areas, creating areas that are not suitable to plants and animals normally found in forests. "China plants more trees than the rest of the world combined," says John McKinnon, the head of the EU-China Biodiversity Program. "But the trouble is they tend to be monoculture plantations. They are not places where birds want to live." The lack of diversity also makes the trees more susceptible to disease, as in 2000 where one billion poplar trees were lost to disease, setting back 20 years of planting efforts. China’s forest scientists argue that monoculture tree plantations are more effective at absorbing the greenhouse gas carbon dioxide than slow-growth forests. So while diversity may be lower, the trees purportedly help to offset China’s carbon emissions. There are many who do not believe the Green Wall is an appropriate solution to China’s desertification problems. Gao Yuchuan, the Forest Bureau head of Jingbian County, Shanxi, stated that “planting for 10 years is not as good as enclosure for one year,” referring to the alternative non-invasive restoration technique that encloses a degraded area for two years to allow the land to restore itself. Jiang Gaoming, an ecologist from the Chinese Academy of Sciences and proponent of enclosure, says that “planting trees in arid and semi-arid land violates [ecological] principles”. The worry is that the fragile land cannot support such massive, forced growth. Others worry that China is not doing enough on the social level. In order to succeed many believe the government should encourage farmers financially to reduce livestock numbers or relocate away from arid areas. AWG-KP - The Ad Hoc Working Group on Further Commitments for Annex 1 Parties under the Kyoto Protocol - Currently discussing changes in accounting rules for LULUCF for the second commitment period of the Kyoto Protocol. Proposed changes relate to setting of national reference levels for carbon accounting for forest management interventions; the cap, or amount of offsets that would be permitted from forest management; and accounting for carbon stored in harvested wood products (HWPs). AWG-LCA - Ad Hoc Working Group on Long-term Cooperative Action - Mandated to explore options for the type of support that should be provided for Phase lll (development of result-based activities that are fully measured, reported, and verified). and will report to the Durban Conference (COP 17). It is likely that multiple channels will be proposed, recognizing the role of the private sector, including through carbon markets, in addition to government assistance. The BioCarbon Fund will purchase 150,000 pollution credits by 2016 from a carbon sequestration project in Kenya. The Kenya Agricultural Carbon Project, which covers over 40,000 hectares, is the first project in Africa that sells carbon offsets from a land management project. It is being implemented by the Swedish NGO Vi Agroforestry, and it is being used as the basis for the development of a Sustainable Agriculture Land Methodology under the Verified Carbon Standard (VCS). CCB - The Climate, Community and Biodiversity Standards - In use by more than 100 projects around the world. CCB Standards enable investors, policymakers, project managers and civil society observers to evaluate land-based climate change mitigation projects by identifying high-quality projects that adopt best practices to generate significant benefits for local communities and biodiversity while delivering credible and robust carbon offsets. CCB Standards do not quantify carbon reductions, so they are often “stacked” with a carbon standard – primarily VCS – to certify projects’ additional social and environmental contribution. In June 2011, CCBA announced that the first two carbon forestry projects have reached verification status against the CCB Standards. While run by different organizations, both projects are located in Kenya. The International Small Group and Tree Planting Program (TIST) managed by Clean Air Action Corporation is a community based reforestation project working with over 50,000 farmers located near Mount Kenya. The sub-project that has achieved verification is 1,565 hectares (3,867 acres) in size and has sequestered approximately 80,627 tons of carbon since inception in 2004 while also generating new sources of revenue and sustainable livelihoods for over 8000 community members. The second project, is run by Wildlife Works and is located in Kasigau is 169,741 hectares (419,439 acres) in size and has generated approximately 1,002,870 tons of greenhouse gas emissions reductions in the first year of operation, providing new and diversified alternative livelihoods to local people and conserving a critical corridor for endangered wildlife. Each carbon project that aims to meet the CCB Standards is first ‘validated’ by a third party auditor. The validation process includes a 30-day public comment period and a site visit to check that the project has been designed to meet the requirements of the CCB Standards criteria and is likely to generate the expected climate, community and biodiversity benefits. Once a project has made progress, third party auditors review another set of public comments and visit the site once again to ‘verify’ that the project has been implemented following the validated project design – and to determine what benefits the project has actually generated. The REDD+ Social and Environmental Standards - Being developed in collaboration with the governments of Ecuador, Nepal and Tanzania to enable government programs to demonstrate that their programs for reducing emissions from land are designed and implemented in a way that ensures a high level of social and environmental performance. the development of climate forestation projects to sequester carbon from the atmosphere. The CarbonFix Standard is administered by CarbonFix a non-profit association based in Germany. FIP - The Forest Investment Program - A program hosted by the World Bank within the Strategic Climate Fund (a multi-donor Trust Fund within the Climate Investment Funds). The FIP's overall objective is to mobilize significantly increased funds to reduce deforestation and forest degradation and to promote sustainable forest management, leading to emission reductions and the protection of carbon terrestrial sinks. To obtain REDD funding under World Bank rules, a country must develop strategies to reduce deforestation, a system for monitoring, reporting and verifying emissions reductions, and a reference scenario that accounts for historic and projected future deforestation rates. The bank’s own technical advisory panel expressed concerns about “significant weaknesses” in the plans of Guyana and Panama and suggested that “analysis of the drivers of deforestation was incomplete and poorly aligned with their proposed strategies”. There is disagreement is over whether there is scope for the World Bank to be involved through its existing carbon funds, its newly proposed climate investment funds and its influence over the Global Environment Facility (GEF), which is currently the operating entity of the UNFCCC’s financial mechanism; or whether funds should be handled within the framework of the UNFCCC itself (a view held by many developing countries, as expressed by the G77/China). FCPF - Forest Carbon Partnership Facility - A global partnership focused on reducing emissions from deforestation and forest degradation, forest carbon stock conservation, sustainable management of forests and enhancement of forest carbon stocks (REDD+). The FCPF assists tropical and subtropical forest countries develop the systems and policies for REDD+ and provides them with performance-based payments for emission reductions. The FCPF complements the UNFCCC negotiations on REDD+ by demonstrating how REDD+ can be applied at the country level. Since it became operational in June 2008, the FCPF has created a framework and processes for REDD+ readiness, which helps countries get ready for future systems of financial incentives for REDD+. Using this framework, each participating country develops an understanding of what it means to become ready for REDD+, in particular by developing reference scenarios, adopting a REDD+ strategy, designing monitoring systems and setting up REDD+ national management arrangements, in ways that are inclusive of the key national stakeholders. FCPF consists of two funds: the Readiness Fund and the Carbon Fund. The former supports countries in developing a national REDD+ strategy (phase 1 and 2), while the Carbon Fund is a public-private partnership due to become operational in 2011 which facilitates the trading in forest carbon credits (phase 3). In the first phase, countries have to produce Readiness Plan Idea Notes (R-PINs), which are the bases for producing the Readiness Preparation Proposals (R-PP), in order to provide the framework for REDD+ in each country. FSC - Forest Stewardship Council - An international non-profit, multi-stakeholder organization established in 1993 to promote responsible management of the world’s forests. Its main tools for achieving this are standard setting, independent certification and labeling of forest products. This offers customers around the world the ability to choose products from socially and environmentally responsible forestry. The FSC Label means that rather than the state, consumers are used to create shifts in industry and regulate the negative environmental impacts of deforestation. The main competing forest certification system is the PEFC (Programme for the Endorsement of Forest Certification schemes), established by a number of stakeholders, including associations of the forest industry, pulp-and-paper production and forest owners in response to the creation and increasing popularity of FSC. FSC has faced criticism for a number of practices, including certifying plantations, clear-cutting, and logging of old-growth forests as sustainable forestry. It has also certified companies linked to social conflict and human-rights violations. In fact Asia Pulp and Paper (APP), a brand that has been widely criticized for large-scale rainforest and peatland destruction in Indonesia, was certified by the FSC until an article in the Wall Street Journal in 2007 pushed the FSC to drop it. Rainforest Coalition - A coalition of nations led by Papua New Guinea and Costa Rica calling for the inclusion of REDD in a global cap-and-trade system. Under such an approach, industrialized countries would finance REDD projects, mainly in developing countries, to compensate for their own emissions. The objective is ambitious – forested tropical countries collaborating to reconcile forest stewardship with economic development. Who: Developing Nations with rainforests -- partnering with Industrialized Nations that support fair trade and improved market access for developing countries. What: Facilitate new and improved revenue streams in order to underpin community-driven environmentally sustainable economic growth. How: Reform international regulatory, trade and economic frameworks to effectively align market incentives with sustainable outcomes. Opponents - This is likely due to two major reasons: long-standing national sovereignty issues about the Amazon, and concern about price depression in the Clean Development Mechanism (CDM). So despite encouraging developments from the world’s largest rainforest nation, deep-seated sovereignty questions remain as to whether Brazil will help REDD along or continue standing in its way. SBSTA - Subsidiary Body on Scientific and Technological Advice - Provide the COP with advice on scientific, technological and methodological matters. Two key areas of work in this regard are promoting the development and transfer of environmentally-friendly technologies, and conducting technical work to improve the guidelines for preparing national communications and emission inventories. The SBSTA also carries out methodological work in specific areas, such as the LULUCF sector, HFCs and PFCs, and adaptation and vulnerability. The principles or objectives of the Cancun decision to include forests in any future agreement with the possibility of generating international carbon credits will still need to be operationalized. The SBSTA is expected to develop modalities on the setting of Reference Emission Levels and the design of measurement, reporting, and verification systems (MRV) and to propose guidance on the establishment of information systems by developing countries to report on safeguards. UN-REDD Programme The United Nations Collaborative initiative on Reducing Emissions from Deforestation and forest Degradation in developing countries. The Programme was launched in September 2008 to assist developing countries prepare and implement national REDD+ strategies, and builds on the convening power and expertise of the Food and Agriculture Organization of the United Nations (FAO), the United Nations Development Programme (UNDP) and the United Nations Environment Programme (UNEP). Norway continues to be the UN-REDD Programme’s first and largest donor. Since the Programme was launched in September 2008, Norway has committed US$52.2 million for 2008-2009, and another US$31 million for 2010. Denmark became the second donor country to join the UN-REDD Programme, committing US$2 million in June 2009 and another US$6 million in November 2010. At the end of 2009, Spain announced its pledge of US$20.2 million to the UN-REDD Programme over a period of three years, and confirmed US$1.4 million for 2010 in November 2010. VCS created a “REDD+ Methodology Framework” to assist in the creation of REDD+ methodologies for project activities in the voluntary market. Each approved methodology has been developed by different consultancy companies such as InfiniteEARTH, Winrock International, Wildlife Works Carbon and Face the Future, to name a few. The Rimba Raya conservation project, which covers nearly 100,000 hectares of peat swamp forest in the province of Central Kalimantan, Indonesia was the first REDD+ methodology approved under the VCS. It was developed by InfiniteEARTH, written by Winrock International and funded by Shell, Gazprom Market and Trading and the Clinton Foundation. VCS has also developed methodologies for crediting AFOLU activities (Agriculture, Forestry and Other Land Use or REDD++), expanding the possibilities to agricultural, peat and pastoral lands. By involving more and more groups interested in profiting from REDD+, the VCS presents itself as an easy way forward without the “hassle” of official regulatory frameworks, while the official REDD+ text within the UNFCCC is still being hotly debated. REDD AND FOREST CARBON: Market-Based Critique and Recommendations The Munden Project March 2011 Concludes that forest carbon is not suitable for commodity trading. This paper analyses critically the measures of REDD negotiated by the United Nations. This analysis tries to answer various questions on REDD’s climate change mitigation power, as well as on who really benefits from REDD funds. The analysis focuses on the financial mechanisms and on their management, which influences its use at a national and local level. The paper suggests in conclusion that the measures should be implemented through participation of Indigenous People helping them to build sustainable livelihoods.